Backup your Postman Monitor Data to Amazon S3. Once data is in S3, you can route your events to any third-party service or trigger event-based actions via AWS Lambda. To integrate Postman Monitors data with Keen, follow the steps below. It should take about 2 minutes. On the left side of the screen, select one of your “Collections”. 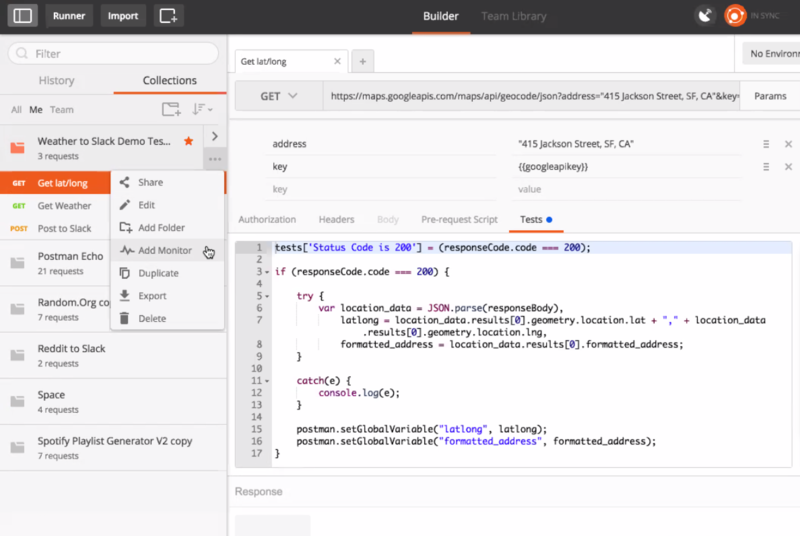 In Postman, a collection is a grouping of individual API requests. In this example collection, we’re pinging the Google Maps API for location data, then asking the Weather Company API for weather data, and lastly posting the results to Slack via their API. Use the drop-down menu to create a “Monitor” for your Collection. Postman Monitors allow you to schedule tests associated with your API calls and check for proper logic, error handling, and logic. In addition, you can observe the uptime and performance of your API requests. Choose a Monitor, Enter in your Keen Project ID and API Key that we found in Step 1. Note: You can send the results of multiple Monitors to the same Keen collection. You’re all done! Provided your Monitor is running, you should start to see data flowing into Keen in a few minutes. Once data arrives in Keen, it will be ready to Explore. 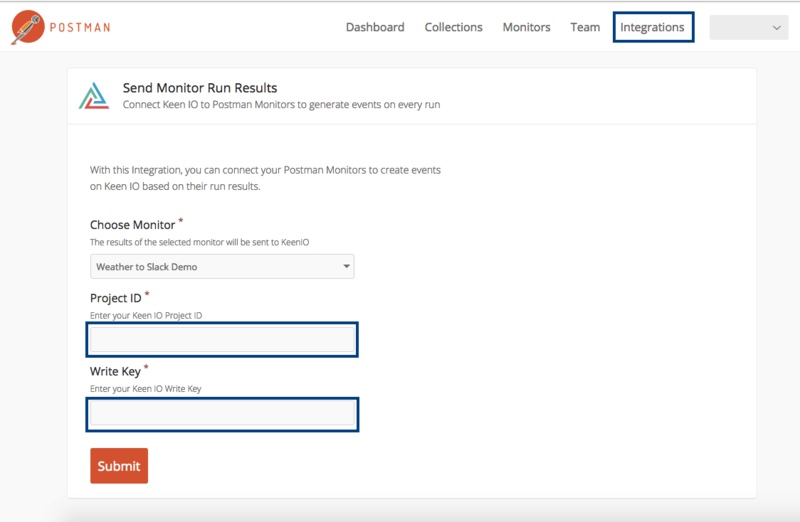 If you’ve sent the results of multiple Postman Monitors to Keen, you’ll be able to segment by monitor name/id, collection name/id, error code, etc. Here’s a preview of analyses we built from the Postman Monitors integration. You can build the visualizations that you’ve seen here into dashboards your team or customers can view, by utilizing our dashboard templates: here.